Miss your favorite stations or talk shows from FM radio? Miss the classics without costing you a monthly fee and your data plan? 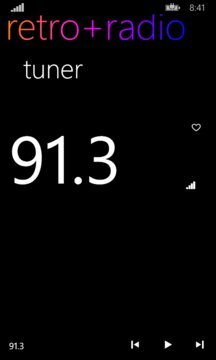 FM RADIO IS BACK! 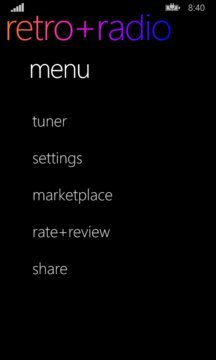 With Retro Radio, your Windows Phone can be used as an FM radio again. Using Retro Radio also is great for saving usage of your phone’s data plan when you just want to listen to music. Using the FM radio can also help save energy by reducing your need to stream music from a network source and keeping a high power antenna running for cellular or Wi-Fi in use. Never be caught without an FM radio in case of emergencies such as natural disaster, power outages, and internet interruptions. Every person should have a way to get important messages from local authorities and the FM radio band is the most reliable method of getting the word out across a wide area. Text Emergency Alert System is not reliable at this time, so be prepared with access to an FM radio anywhere you take your phone. Download Retro Radio today and keep your ability to stay tuned in when you need it the most. Using Retro Radio also is great for saving usage of your phone’s data plan when you just want to listen to music. Using the FM radio can also help save energy by reducing your need to stream music from a network source and keeping a high power antenna running for cellular or Wi-Fi in use. All phones are required to have FM receivers. Download Retro Radio today and share with your kids a way to relive the past and rediscover music the way that you used to get all your music. Headphones/wired accessory are required for radio to function.